Family owned and operated: Many death care businesses in Central Florida are owned by huge chains and multi-national conglomerates. We, however, proudly remain independently owned and operated. Porta Coeli Funeral Home & Crematory and our staff believe that we are accountable to you, not far-away stockholders. We believe that the most valuable thing we own is our reputation. We are kind, gentle, and knowledgeable men and women who respect your right to choose without pressure or undue influence. Every staff associate is expected and empowered to do anything it takes to serve your family well. The owners and staff of Porta Coeli are your neighbors, and we are the ones who live and are active in your community. Personalized services: Our staff is specially selected and trained to facilitate services that reflect your needs and cultural traditions. Our goal is to listen, suggest, organize, and carry out ceremonies that will be comforting and full of meaning. Price and value: We understand that we have only one opportunity to serve you and your family sensitively and correctly, and we have always voluntarily adhered to high standards. We attract and retain the best professional, compassionate, and knowledgeable staff possible. Our people provide consistently outstanding care to those we serve. 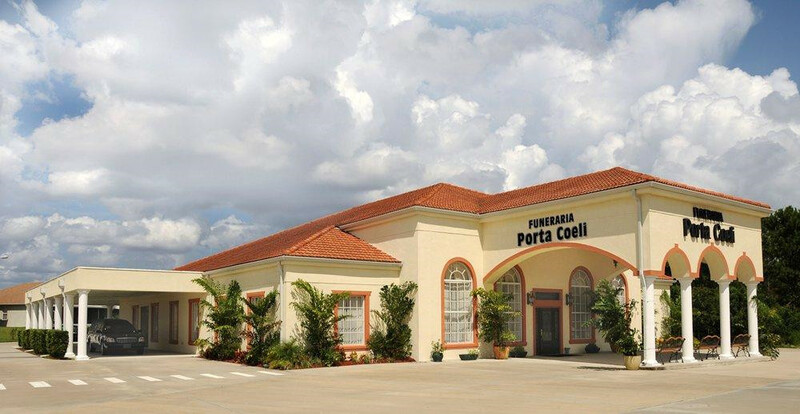 All your needs at one location: Since Porta Coeli Funeral Home & Crematory owns and operates its own funeral home and is associated with Osceola Memory Gardens Cemetery and St. Cloud Florist, we can offer you “one-stop” service. This enables you to work with one firm, allowing all your funeral, cemetery, cremation and floral arrangements to be cared for in one convenient location. Click here for more information regarding Osceola Memory Gardens Cemetery. Why having our own Crematory is important to you: Porta Coeli Funeral Home & Crematory owns and operates its own Crematory. This gives us the ability to control and oversee every aspect of the cremation process. As a result, we can ensure families’ ultimate security and the most dignified handling of every cremation. You’ll take comfort knowing that your loved one never leaves the shelter of our expert care. Our highly trained and certified personnel perform all cremations following a strict and secure process with our state-of-the-art equipment. Click here for more information. Planning for your future: We provide complimentary assistance with planning your funeral ahead of time. You have the option of locking in today's prices and funding your plan or simply placing your wishes on file and allowing the costs to be paid at the time of need. Pre-planning ensures your wishes are carried out, prevents emotional overspending, locks in today's prices and relieves your family from the burden and cost of making difficult decisions. Click here to learn more. Returning Home to Your Country of Origin: Repatriation services is a process of helping families bring their loved one home after a death has occurred. We can help. With our multi-cultural community, it's important for a funeral home to be properly equipped to help families get their loved one home. The process of repatriation can be difficult and complex. We have years of experience in helping families through this process. We have relationships with consulates across the globe and can handle the entire process for you. Our Guarantee to you: Our fair prices represent the greatest value in the area. Our staff is kind, considerate and knowledgeable. Our facilities are updated and immaculate. If you are dissatisfied with any of our professional services or facilities, we will reduce or eliminate that charge. We would like to thank you for extending to us the privilege to serve you. Through our experience, we understand the importance of our role and are dedicated to providing you the best possible service in order to create a meaningful, appropriate, and affordable tribute. For more information, please feel free to contact us at (407) 846-2804 or click here for the "Contact Us" page – thank you. Terry moved to Kissimmee in 1960, a week after Hurricane Donna came through. He graduated from Osceola High School in 1965. Married Annette Gorski in 1966 who was the stepdaughter of Horace Phipps, founder of Osceola Memory Gardens in 1958. Terry graduated from the University of South Florida in 1970 with a Bachelors degree in education and a minor in accounting. He has been employed with Osceola Memory Gardens since 1972 where he started in cemetery maintenance and was a grave digger. Terry was appointed General Manager in 1984 and became a partner in 1996. Terry served as past President of the Rotary Club of Kissimmee as well as past President of Florida Cemetery Association. Tom has been a licensed funeral director since 1987. He has been with Funeraria Porta Coeli for over 10 years and with Osceola Memory Gardens Cemetery and Funeral Homes (we are affiliated) since 1997. Tom enjoys helping families through a difficult time. He is married to his lovely wife, Julie and has four wonderful children. He is a member of Holy Redeemer Catholic Church, Kissimmee Elks Lodge, and Knights of Columbus. Tom enjoys golfing and spending time with his family. Ludmila De Oliveira was born in São Paulo, Brazil where she was raised through her teenage years. In 1996 she moved to Florida with her family and started working in the funeral industry at the age of 18. Besides working in a funeral home she was also a Monument Sales Agent for many years. In 2007 she decided to go back to school and study to become a Licensed Funeral Director, and in 2010 she graduated from the Mortuary Services Program at the Miami-Dade College and became licensed in 2011. With over 20 years in the industry, Ludmila has gained a vast experience working with persons from various cultural backgrounds and have developed good relationships with Consulates from many Countries, becoming an International Shipping Specialist. She is also fluent in English, Spanish and Portuguese and became part of our team in December 2017. Ludmila is a proud mother of her son Giovanni, and in her free time she enjoys spending time with family, traveling, reading and fishing. Vanessa was born in New York City and earned her BA from Fordham University in Media Studies. While still a student, Vanessa participated in the National Latino Leadership Opportunity Program where she was able to learn about issues affecting her community and network with researchers, policymakers, congressional leaders and representatives of national organizations and philanthropic foundations. This experience put Vanessa on the path of seeking new ways to help communities and people. She has since integrated her media background and her passion for serving people in every position she has held. Vanessa has worked on a number of notable projects in different media including; documentary filmmaking for Third World Newsreel and PBS, Organizing NYC’s Muevete Youth Conference and Marketing a start-up magazine. She left New York City in 2003 and moved to Central Florida to work for Cox Media Group’s WPYO/WCFB as Marketing Director. After 7 years in broadcast marketing she went on to work for the City of Kissimmee, where she was the Supervisor of Public Events and Venues overseeing the city’s largest events including the Presidential Visit to Kissimmee in 2012. Vanessa Roman is currently the Public Relations Director for Osceola Memory Gardens, Porta Coeli and Fisk Funeral Home where handles community relations, sponsorships, donation programs and event organizing. Her current position allows her to be active in her community, while still finding ways to help. She lives in Saint Cloud with family. Sandra was born and raised in Dominican Republic. She graduated from Eugenio Maria de Hostos University in Santo Domingo, Dominican Republic with a degree in Business Administration. She is bilingual. While living in the Dominican Republic, she worked at City Bank for more than six years. During the years 2000-2005 she developed her own business importing tires from United States. She moved to Orlando, Florida with her family and started working at Starwood Vacation Ownership for almost four years. She obtained her License as Family Service Advisor and she has been working at Funeraria Porta Coeli and Osceola Memory Gardens since 2013 where she applies her customer service experience of over twenty five years by offering careful orientations with warm support and advice. Anamaria was born and raised in the Dominican Republic. She worked at Banco de Reservas in Santo Domingo while pursuing a Marketing career at Eugenio Maria de Hostos University after which she moved to New Jersey in 1987. She started working at Pan American Airlines in the payroll department. After Pan American’s bankruptcy, she moved to Florida to explore new opportunities. Anamaria worked at Westgate Resort, Vistana Resort, Sunpass Operations and maintains a Florida Real Estate License. She joined Funeraria Porta Coeli and Osceola Memory Gardens in 2015 as a bi-lingual, licensed Family Service Advisor which gives her the opportunity to take care of families in times of need as well as allowing her to help families make decisions in the best way. I was married for 50 years when my husband passed away. I have 4 adult children and 11 grandchildren. I am a Grief Counselor and hold a Grief Support Group weekly. worst time of their live. Reina was born in El Salvador. She has been married for 18 years and has 3 kids. She's a nice, caring and hardworking person. She used to lived in New York City then moved to Florida and has joined the Osceola Memory Gardens and Funeraria Porta Coeli family. "Tom" was born in Brunswick, Maine. He moved to Florida with his family in 1969. Tom is a 1992 graduate of the Miami-Dade Community College with an Associate Degree in Funeral Service Eduction. Tom believes in the value of community service and is involved in the community in a number of ways. He has served as President of the St. Cloud Chamber of Commerce, The Rotary Club of St. Cloud and is an active member, as well as The President of the Board of Directors for the Osceola County Council on Aging, where he continues to serve on the board. Tom lives in St. Cloud with his wife Kim and their 3 dogs and 4 cats. Vern was born in Brunswick, Maine and moved to Florida as a young boy. After many years working in the Funeral Business, He attended Miami Dade Community College earning an Associate Degree in Funeral Service Education in 1991. He Worked for the Kraeer Funeral Homes until 1996 when he relocated his family to Ocala, FL. where he worked at the Page Theus Funeral Home. In 2002 he joined the staff of the Osceola Memory Gardens Funeral Home and Funeraria Porta Coeli. Vernon has participated in the Kissimmee Bay and Poinciana Rotary Clubs and The Poinciana area Chamber. Vern and his wife Carol reside in St. Cloud with his son Vernon and daughter in law Stephanie. Bonnie was born in Rockford, IL. She was raised on a farm in Central Wisconsin where she helped raise cattle, goats, pigs, sheep, horses, lambs and ducks. From that she learned compassion, love and affection towards both animals and people. She began her career in the hotel and travel industry helping to ensure people their vacation of a lifetime. Later she moved to Central Florida where she met the love of her life and they were married for over 20 years. Osceola Memory Gardens and Funeraria Porta Coeli welcomed Bonnie over 12 years ago to educate and assist families in the process of pre-arranging their final wishes; because of her level of understanding, compassion and commitment. Her love of family resonates in everything she does and every person she works with. She loves the Green Bay Packers (Cheese heads), NASCAR (Earnhardt) and outdoor activities including: playing and walking with her dogs, boating, gardening, reading and whatever she can get in to. Robert was born in southwest Georgia and grew up in the Haines City – Winter Haven area of Central Florida. Graduated from Polk Community College and was immediately drafted into the U.S. Army serving two years in Germany. Upon discharge he attended the University of Central Florida for 2 years majoring in Business Administration and Accounting. Worked in the Citrus industry until he met and married his lovely wife of 35 years who is also from southwest Georgia. They settled in Kissimmee and have one son who now resides in the St.Pete – Largo area. Robert has many years of experience in estate planning and the financial services industry which brought him to the Advance Planning Department of Funeraria Porta Coeli in 2002 and Osceola Memory Gardens in 1998. He enjoys helping individuals, couples and families accomplish their “planning ahead” of both funeral services and cemetery options. Over the years he has helped hundreds of families save thousands and thousands of dollars by prepaying and locking-in current prices. Robert is a member of and has attended Lock Haven Baptist Church for over 20 years where he served as a Deacon as well as treasurer.